The Wide Bar Black Gladiator Clownfish is a new Sea & Reef signature designer clownfish. It is developed from the Wide Bar Mocha Gladiator Ocellaris Clownfish, which has much wider white bars than a regular Ocellaris Clownfish. In fact the white bars are about twice as wide compared to that of a regular ocellaris (or Darvin Ocellaris) clownfish. 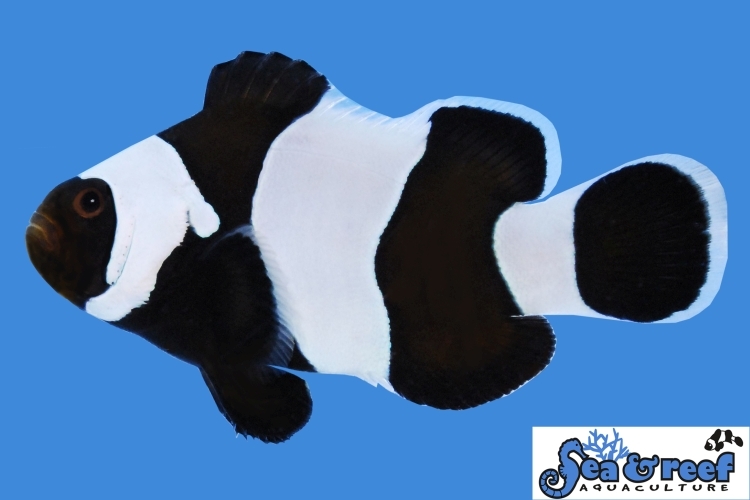 We created our Wide Bar Black Gladiator Clownfish by breeding our Wide Bar Mocha Gladiator Ocellaris Clownfish with our super black Darwin Ocellaris Clownfish through several generations to produce an all Black and White version of this gorgeous designer clownfish. Like the Darwin Ocellaris Clownfish the Wide Bar Black Gladtiator Clownfish starts out more brown than black. As they grow they develop their deep black coloration. The last part of the fish to turn black is the area around their mouth, which typically happens when the fish is about 2" long. The original Wide Bar Gladiator Ocellaris Clownfish was first bred by legendary fish breeder Bill Addison, owner of C-Quest hatchery, who created and named this designer clownfish. The production of Wide Bar Gladiator Ocellaris by C-Quest stopped in 2010 when the hatchery closed. Sea & Reef acquired some of the original Wide Bar Gladiator Ocellaris Clownfish stock and in February of 2014 we brought this beautiful designer clownfish back. We are proud to continue the development of this designer clownfish by giving you the Wide Bar Mocha Gladiator Clownfish and now the Wide Bar Black Gladiator. The temperament and captive care requirements for Wide Bar Black Gladiator Clownfish are very similar to that of the regular Ocellaris Clownfish. It is relatively peaceful and hardy. They thrive in saltwater aquariums with or without an anemone present. Most clownfish are omnivorous feeders, meaning that they will consume a variety of different food types. In nature the diet of clownfish consists of crustaceans (such as copepods and amphipods), algae, polychaete worms and leftovers from the anemone’s meal. Our captive bred fish are conditioned to eat a variety of aquarium diets including pellets, flake food, frozen Mysis shrimp and frozen brine shrimp. Clownfish do not require host anemones to survive or thrive. However, in most cases they will readily accept them. Wide Bar Black Gladiator Clownfish will readily accept a wide variety of host anemones. As a reference, the natural host anemones of the regular Ocellaris Clownfish are Magnificent Sea Anemone (Heteractis magnifica), Giant Carpet Sea Anemone (Stichodactyla gigantean) and Merten's Carpet Sea Anemone (Stichodactyla mertensii).